We must remember that the news of Jesus is Good News! Jesus came bringing healing and hope. Therefore, where there is disregard, we try to be the hands of Jesus laboring for conservation and care. Where there is violence, we strive to be the feet of Jesus practicing peace. Where there is discouragement, we join Jesus, and through empathy, we encourage hope. As an essential aspect of faith’s journey we encourage Jesus-like service of neighbors, both near and far. Action flows naturally from faith. In fact, the opposite of faith is not doubt but disobedience. The prophets remind people of faith that what is required is to act justly, love mercy, and to walk humbly with God. Jesus tells his followers that next and along side of “love of God” is “love of neighbor”, and simply, we believe Jesus was right! Our history confirms a deeply rooted commitment to justice for all people; including those who experience deprivation, oppression or prejudice, and victims of war, natural disasters and adversities. Actively living the Good News means using your gifts and energies to help others. Someone needs exactly what you have to offer. We can help you find your place to serve. Giving of one’s self to others is a vital part of living out our Christian faith. Time and talent are as valuable as money in sharing the Good News. A wide variety of volunteer opportunities exist with First Christian. Some are long-term, some are short-term. Some involve organizations and activities within the church; some focus on involvement with our surrounding community. Please contact any church staff member to learn more about volunteering with Worship, Nurture, or Service. We believe in sharing resources. 10% of our annual church budget is donated to partner organizations who help bring God’s love and justice to our city and our world. Respecting that each of our donors give as much as they can, knowing that others cannot give as much as they’d like, First Christian Church values institutional generosity and gives financially beyond the ministries of our physical location. Our annual budget includes 10% giving from regular offering income, and throughout the year we take up special offerings for local, national, and worldwide ministries inside and outside the Christian Church (Disciples of Christ). In 2013, First Christian Church gave away $118,833! In 2012, $119,610! For 2014, total philanthropic giving was $75,367. Although we have fallen short of our goals for last year, due to various necessary changes, we look forward to meeting our philanthropy goals for 2015! Iowa Justice for Our Neighbors and Interfaith Alliance of Iowa. 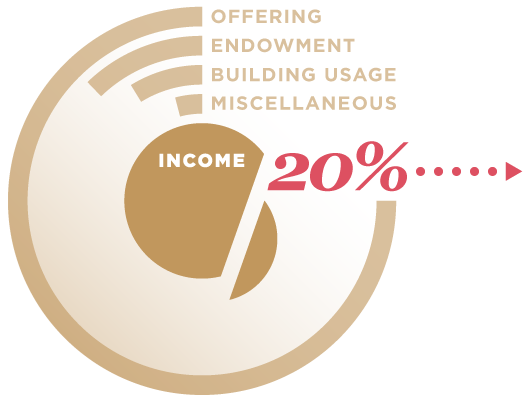 We have four main income sources: Offering, Endowment, Building Usage, and Miscellaneous. From that income we give away over 20%. We invite you to contribute what you can so we can continue sharing with our community.